I hope that you are all keeping warm at this time of year, with plenty of layers, a warm home and don’t forget to exercise to your ability. We are all different on this one. We had sad losses of members this year. We will remember them all in our hearts. I hope that you are all coping. It is difficult and we all cope in different ways, Remember that we are all here to support each other. We also have members experiencing difficult times with their scleroderma. Our thoughts and support are with you all. I thank the committee for their support this year. Through voluntary commitment they have achieved much. Thanks too, to Barbara and John Spavin for producing the newsletters and website. It has been a life-line for our isolated members and those who can’t attend a regional meeting. We much appreciate it. Thanks also to Cushla Marsters and her team on our FaceBook page. I believe we will have some new things happening on it this coming year. Thanks again Cushla. We get a lot of interest from people abroad. All our regional groups from Southland, Christchurch, Wellington, Palmerston North, Hamilton, Auckland and Allan and Sandy Edmondson’s PAH and respiratory group are running well. I extend a huge vote of thanks to all the group organisers. They hold us all together. Great friendships have been made and support has been valued across the country. In June, Adrienne Burleigh, Leony Reid and I visited the Palmerston North ladies and their art exhibition. Chris Carlyon welcomed us into her home with a delicious lunch she had prepared. Later we went to the exhibition. I’m looking forward to the next visit. All our Palmy ladies made such a big effort. Adrienne contributed with her beautiful hand-knitted teddies. Gordon and I met Allan and Sandy’s group in November and December. They made us welcome and we had a lovely time amongst friends. Allan and Sandy made a big effort for the Christmas celebrations. Everyone had a great time. We also enjoyed a welcome from Jenny and Heather’s group in Southland in early March. They gathered to meet us. We chatted with everyone and appreciated their efforts. Join us in Wellington sometime too. You are all welcome. Scleroderma awareness month starts on 1st of June for the whole month. It will be exciting to see what each region is up to. We have our annual appeal on the 30th of June. Please give what you are able to. Believe that we will put it to good use. Linda Bell will be having another of her worthwhile seminars. I hope many of you can make the trip to support Linda. She has brought a lot of us together over the years. So please attend another good session on the 27th of October in Hamilton, I know you will learn a lot and a meet new and old friends. We started the year off with the podiatry survey, in which about half of our members participated. Thanks to those who did. We can now lobby for free podiatry services for scleroderma patients. Gordon has worked hard to make the data readable. 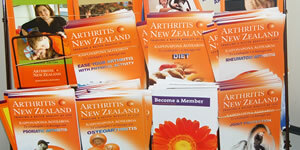 We aim to have a journal of rheumatology or the New Zealand Medical Journal publish it. We hope that you all keep as well as possible. Take care of yourselves in all ways to make the most of every day. Thank you all very much for your support and friendship over the years. A special thank you to Gordon for all his commitment and support to us all. Warm Wishes Dianne Purdie President.